Provide comfort for the family of E.E. "Bud" St. John with a meaningful gesture of sympathy. Bud was born on March 19th 1926, in Billings, Montana to W. E. and Dora (Jackson) St. John. Bud spent his early years in Custer and attended Custer High School. He enlisted and proudly served two years in the United States Navy assigned to the USS Gasconade in the South Pacific. He watched the formal signing of the surrender of Japan in Tokyo Bay. Following his honorable discharge from the Navy, he returned to Custer and worked alongside his parents at the family hardware store. On September 23rd 1949 he and his lifelong partner and love of his life Ruth Ann (Sally) Mathison were married in Texas. They returned to Custer, and in 1950 moved to Billings where they raised their three children Deborah, William, and Timothy. Bud was a dedicated 38-year employee with the State of Montana Highway Department when he retired. He enjoyed his retirement with daily rounds of golf and traveling to visit his children and grandchildren. His travels spanned many states as well as Canada and Germany. 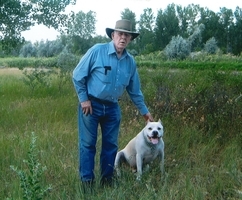 Bud’s true passion in life was “The Family Ranch” whether it be observing the land, mending fences, tending crops, selling gravel or the annual fall harvest he was always there. In April 2013 Bud was invited by the Big Sky Honor Flight to join fellow Montana veterans to visit the World War II Memorial in Washington DC and be honored for their service to the nation. He was a long-time member of the Masonic Lodge and a founding father of American Legion A.C. Buckner Post for which he was the last surviving original founder. He also served on the Big Sky Federal Credit Union Loan Board for 39 years. Bud died peacefully at home on March 26th 2019. He is survived by his wife, Sally of 69 years; his three children Deborah (Thomas) Carlsen, William (Jing Li) St. John, and Timothy (Susan) St. John, five grandchildren Rebecca (Patrick) Boland, Jennifer Carlsen, Chad St. John, Kyle (Laura) St. John and Brenton St. John along with three faithful great grand dogs Marshall, Mollie, and Louie. He was preceded in death by his parents W. E. and Dora St. John, sister Mildred, and brother William. The family conveys thanks to the Riverstone Health Hospice Services caregivers with a special thank you to Heidi. Heartfelt appreciation and thanks go out to Mike, Judy, John, Leanne, Lynn, Amy, Pat, Ida, Mel and Sue. The finest people and best friends anyone could ever hope to have. Family will greet friends Wednesday, April 3rd from 6:00 to 8:00 p.m. at Smith Funeral West Chapel. Service will be held Thursday, April 4th at 2:00 p.m. at Smith’s Funeral West Chapel, 304 34th St. West, Billings, internment at Terrace Garden Cemetery with a reception following at the West Chapel. Instead of flowers, donations can be made either to the Custer Senior Citizens Center or Custer Cemetery. To plant a memorial tree in honor of E.E. "Bud" St. John, please visit our Heartfelt Sympathies Store. We encourage you to share your most beloved memories of E.E. "Bud" here, so that the family and other loved ones can always see it. You can upload cherished photographs, or share your favorite stories, and can even comment on those shared by others. Plant a Tree in Memory of E.E. "Bud"